Daft Punk won a lot of Grammys last night. Or at least they won the important ones. Keeping in robotic character, they never removed their helmets, nor actually made acceptance speeches. While I personally thought the entire broadcast was pretty much a disconnected train wreck, at least it was a difficult one to turn away from. Most of the acts were a mix of simultaneous good and bad with Paul & Ringo reuniting to not perform a Beatles song (FAIL), Metallica rocking out with a Chinese pianist (something we've all been crying for), and Stevie "Jammin on the One" Wonder's first relevant appearance since the Cosby Show in 1986. Oh hey, look up in the sky...there's P!nk! But back to Daft Punk. Why the helmets, why the mystery? Oh, and are they really from France? 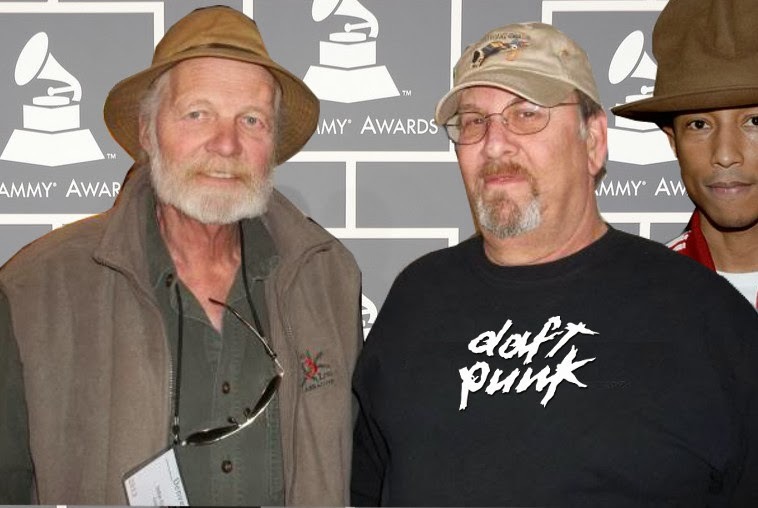 Thanks to a Google search of post-award show after parties, I was able to unmask our robotic heroes. I heard he was feeling better, but who knew? 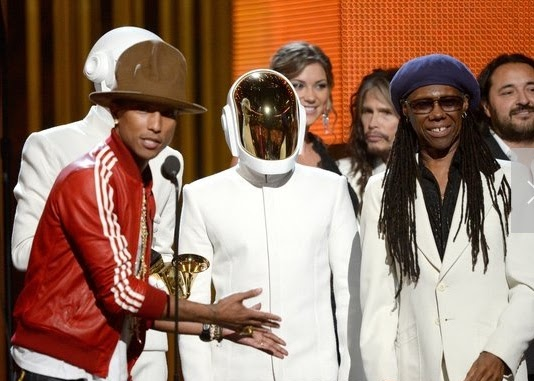 I couldn't figure out what was weirder, Daft Punk or the hosts brown hat? Looks like a paper bag with a brim on it. I guess I'll never understand fashion. Thank you Mike. Made me laugh. Since I didn't watch, I'll have to take your word for it. You've unmasked the superhero. Damn you T, Damn you!